ABB variable speed drives brings together a world leading and recognised brand - ABB - the number one supplier for AC variable speed inverter drives and a product range that is simply the widest available from any manufacturer. 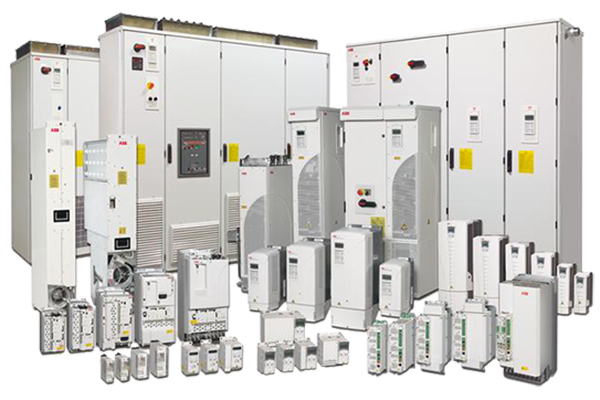 ABB Drives is a reference for drives users the world over that signifies reliability, simplicity, flexibility and ingenuity, throughout the lifecycle of ac inverter drives. As an ABB Authorised Value Provider (AVP) Halcyon Drives is the leading inverter drives distributors in the UK. We cover a wide range of ABB Drives offering both the single phase and 3 phase ranges of ACS55, ACS150, ACS310, ACS355, ACS550, ACH550, ACS580, ACS800 & ACQ810, which are stocked from 0.18kW to 250kW. In addition to the standard stock packages, we have a wide range of expertise in application design, programming, repairing and commissioning of control systems, offering our customers a completely packaged inverter drive solution. We are conversant with most other variable speed inverter drives and have a wide experience with Servo Drive Applications, DC Drive Systems and Power Transmission needs. IE4 synchronous reluctance motors (SynRM) enable extremely efficient installations. The low running temperatures of ABB synchronous reluctance motors mean high reliability and low maintenance costs. SynRM motors combined with the latest drive technology and purpose-designed software ensures optimal efficiency and reliability. With legislation and the requirements of our customers ever changing, choosing the correct ac motor to meet your needs can be a daunting task. Our customers believe our service and support is essential in helping them make the correct selection of ABB motors. Full sales & technical support from our experienced ABB motors team. As an Authorised Value Provider (AVP) of ABB, the market leaders in the manufacture of reliable and high efficient AC motors, we believe service and support is as equally important as the quality of the product. The partnership between ourselves and ABB has meant that we can specialise and deliver the quality service direct to our customer. Our up-to-date knowledgeable and experienced team are trained regularly by ABB using such software tools as ABB Drive Size and ABB Motor Size. This has enabled us to become an ABB AC motor specialists with a successful partnership with ABB spanning more than 20 years, including founder member of the ABB Drives Alliance and ABB Motor Service Partner networks. We are able to offer an extensive range of IE2, IE3 & IE4 ac motors on safe area applications, but also understanding the requirements for ATEX/IECEX ac motors for use on fixed and variable speed applications. As one of the largest suppliers of ABB motors and drives within the UK we hold stocks of ABB ac motors locally up to 75kW and, with direct access to stock of ABB motors in Menden, we have the ability to provide a next day delivery service of up to 500kW. ABB is the world No1 supplier of solutions to improve the power quality of the low voltage network. Thanks to an extensive experience and use of the latest technologies, ABB develops, designs and manufactures a comprehensive range of products and solutions which improve the power quality of the Low Voltage Network by eliminating disturbances and improving power factor. The ABB softstarter portfolio now consists of 4 different ranges making it possible to find a suitable softstarter for almost all pos­sible applications and motor sizes all the way up to 1800A. The softstarter family consists of the Compact PSR, the Flexible PSS, the Efficient PSE and the Advanced PST(B) range The range covers all motor applications from 3 A to 1810 A used in a main voltage between 208 V to 690 V AC. Whatever the safeguarding problems, we can supply the solutions offering a range of SAFETY automation products from Rockwell Automation whom is one of the leading specialists in industrial automation able to offer a wide range of failsafe equipment. Halcyon Drives is a major UK distributor of Allen Bradley Guardmaster™ which is one of these brands offering safety switching devices & sensors and advice for the safe design and use of machinery and equipment across many sectors of industry. The main area of focus is interlocking and control devices that provide safe working conditions for operators and machines. The Rockwell Automation Allen Bradley Guardmaster™ branded components are manufactured in the UK fundamentally incorporate reliability and security, but their products and expertise in machinery safety are available worldwide. RIELLO UPS is today one of the largest manufacturers of uninterruptible power supplies in the world, with a complete range of UPS able to satisfy any energy requirement. Uninterruptible power supplies are mission critical pieces of equipment and without support and quick turnaround when needed, manufacturing plants can be left at risk. Halcyon Drives and Riello UPS have partnered as solutions providers for over 10 years. Our successful partnership with Riello UPS revolves around the two businesses being streamlined for outstanding customer service and speed of response when delivering equipment. As part of Halcyon Drives product portfolio we offer a comprehensive range of Riello UPS - Uninterruptible Power Supplies 350 VA to 6 MVA. Machine Construction - Control and Automation - Plant and Systems Construction - Robotics - Drive Technology - Building Automation - Lighting Technology - Cleaning Technology - Construction Machinery, etc. As the products have been certified to meet a wide range of codes and standards, they can be readily installed throughout the world. or Contact Us to request your FREE copy in the post.